Lately, my shopping has gotten out of hand. I'm being completely serious now, this is unsafe. I am skint! I don't regret it though as I have purchased some beautiful products. Above is a few of my favourites from my recent purchases. So I have the Urban Decay Naked 3 Palette but I have never purchased the first one. Seems silly as it looks pretty essential to have! I actually picked this up from Depop (which is an app that everyone needs to check out if you haven't already) already I have used this everyday and I am loving it. Seconds up is the Naked Flushed Palette in Strip, I have been wanting this for so long! But I just haven't got round to it, and it is amazing. Each shade isn't over powering at all, they last all day long and give such a gorgeous glow. I picked this up from Beauty Bay in the sale, the sale price probably tempted me more, let's be honest. Thirds up, the Naked Basics Palette 2!!! I love the first one, for an everyday look and it is compact so it easily fits in your make up bag. The shades are a little bit similar to the first palette but they still create a compeltely different look. Again purchased from Beauty Bay in the sale! Elizabeth Arden, the first product I own - I have read good reviews about this mascara however it is £22.00 for a mascara! Yeah I was shocked too. I haven't yet tried it myself, but once I do I'm sure you'll hear of its good or bad news from me soon. Soap & Glory Carbon Black Extreme Eyerliner Pen. This cost me £6.00 and it is the best eyeliner I have EVER used. This is not being dramatic at all. It really is carbon black too, not a faded black, it is true in its word. Let's not forget to admire their glorious packaging too. Benefit Coralista Blusher - haven't yet tried this, but from swatches it creates a peachy glow which is what I am after. High hopes as their mascara is the best mascara I have tried. Lastly, I have become tired of using my holy grail Sleek Eyebrow Kit and I noticed that Beauty Bay were selling Anstasia Beverly Hills Dipbrow Pomade - I got the shade Ash Brown as my Sleek Eyebrow Kit was too warm toned for me. If you're seeking a strong eyebrow game - then this is for you. 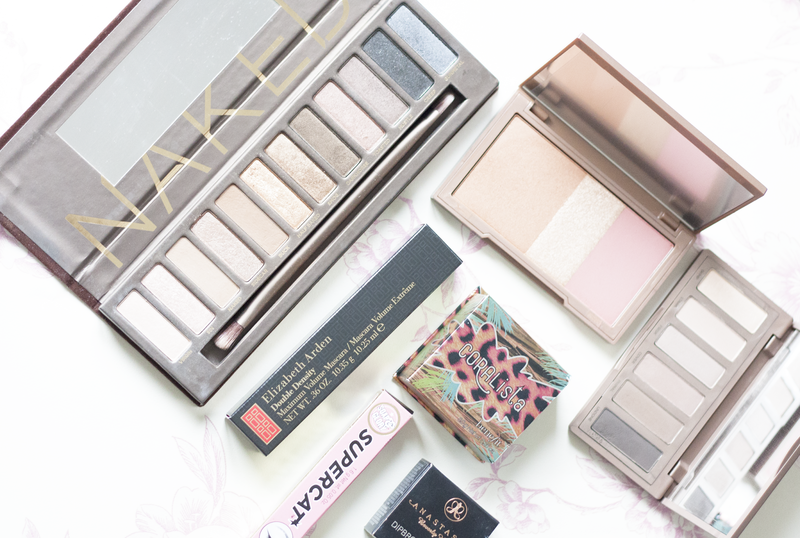 Great choices, you're going to love the Naked originals palette, it's such a must have for everyone!